Eagles wide receiver Greg Ward Jr. makes a catch during minicamp at the Eagles NovaCare Complex last month. Ward played quarterback in college at Houston. If Greg Ward Jr. makes the Eagles roster, it would affect not only him but also his four-year-old daughter. Football is how the wide receiver intends to provide a life for his daughter that his parents were not able to give him and his five siblings. "It was a good life. Our parents did what they could. We didn't have much, but we made do," Ward said. "Kids really put things in perspective, and that makes me want to grind even harder, especially for my parents and my family, and be able to take care of my family some day. Since I have this opportunity presented to me, it's just like I have to seize every moment and take advantage of it. You can't slack up in practice not a second of the day. You have to work harder than anyone else." Ward is battling for one of the Eagles' six receiver spots on their 53-man roster. Ward was an undrafted quarterback out of the University of Houston last year. His 5-foot-11, 186-pound frame was a limitation as a quarterback at the pro level, and that forced him to switch to receiver after the Eagles picked him up as a free agent. With Alshon Jeffery, Nelson Agholor and Markus Wheaton out with injuries, Ward has taken first-team snaps over the last week and started in the Eagles' first preseason game last Thursday against the Pittsburgh Steelers. Even though he was targeted only once in the Eagles' 31-14 loss, he appreciates the opportunity and knows that there is still a lot of work to be done to survive the final cut. "It was a blessing to be able to start," Ward said. "You know Nelson is down. I was just ready when my name was called." Agholor said "G-Ward," as he calls him, is good enough to play in the NFL. "His knowledge of the game has always been very impressive. 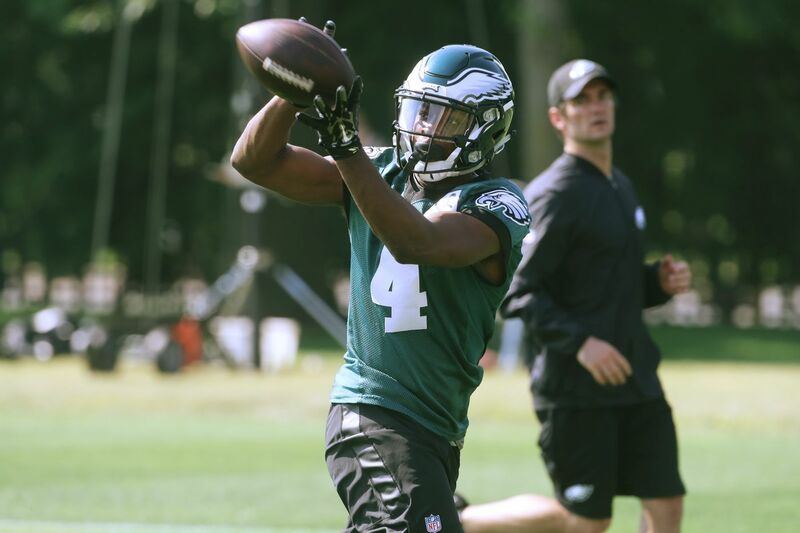 This is his second year in this offense, but also I see his hunger," Agholor said. Eagles wide receiver Greg Ward (left) with fellow rookie Donnel Pumphrey during last year’s training camp. Ward spent all of last season on the Eagles practice squad, which he said prepared him for a contributing role this season. "We worked extremely hard. Guys like Malcolm Jenkins and Rodney McLeod, they never wanted us to lighten up," Ward said. "They always wanted us to go hard and to get them better. I feel like that brought the best out of us. "I feel like those guys really helped us a lot. Especially because it wasn't like a normal scout team. It was like we're going after them. We're going to try to catch the ball, and we're going to try to make plays. They were doing the same. It was every single day, and we weren't taking any days off." Ward thinks another difference between this year and last year is his attention to detail, and watching film of other receivers in the league. "You actually have to do the little stuff right. You have to watch film on other receivers, footwork, all of that stuff. You have to do it every single day," Ward said, naming the Steelers' Antonio Brown, the Giants' Odell Beckham Jr., the Redskins' Jamison Crowder, the Seahawks' Doug Baldwin, and the Patriots' Julian Edelman. Ward's pro journey has mirrored that of his high school and college career. He went to John Tyler High in Tyler, Texas, where Hall of Famer Earl Campbell got his start. He received only five college offers, according to Rivals.com. Of the five, he spoke only to Houston. Initially, the Cougars' offer was to play defensive back. But the Cougars staff saw him playing at quarterback as a senior and changed its mind about his position. "I was a quarterback all throughout high school," Ward said. "I never played DB, but I went to a camp in Hillsboro [Texas]. They had me at DB, and I guess I was making plays. [Houston coach Tony Levine] wanted to offer me, so he offered me. So I committed at DB, and that was my junior year [of high school]." Ward ended up starting the first five games of his sophomore season at wide receiver for Houston before switching to quarterback and starting the next eight games under center. As a senior, he broke Houston's career rushing record by a quarterback with 2,375 yards.